GRE released data on number of test-takers for the first time. GMAC had been sharing data and profile trends on GMAT test takers for several years. 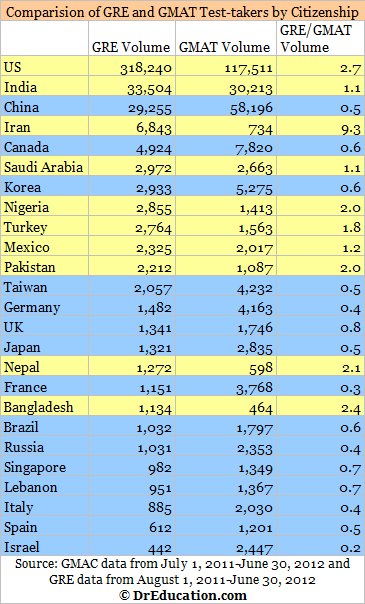 I have compared the two test-taker volume for 25 countries. Most of the developing countries outside the US have a pattern of higher number of GRE test-takers as compared to GMAT (yellow cells in the table). These countries have lesser number of GMAT test-takers as business education expects students to be self-funded as schools offers very limited to no financial support, except for doctoral programs. Saudi Arabia is an exception where fully-funded scholarship program has broadened the fields of study options for students. In contrast, countries where students have higher capacity to pay for their own education and have less dependency on financial aid has larger number of GMAT test-takers. This includes China where number of GMAT test takers is almost double than GRE test-takers. Here is a previous analysis comparing GMAT test takers from China and India. Of course, GRE test is used for much larger number of fields including business, however, GMAT is used for business programs only. However, this comparison would aid institutions to prioritize and compare markets. Thanks for posting and publicizing these stats. Having this information/analysis in the public domain is infinitely more valuable than it being cloistered away in some journal. So, keep up the good work. I also blog on international education issues, and recently wrote a piece on Iranian students (which you might find interesting due to their high GRE testing numbers). Thanks for the info, and keep it up.